Now entering its eighth year, the Unbridled Eve Gala has become one of the hottest tickets in town during Derby week. With its closely-guarded list of celebrity attendees and two determined sisters at its helm, this gala has been an uncontested game-changer for the social whirlwind that surrounds our global sporting event. Rocko Jerome sat down with Tonya York Dees and Tammy York Day, the power duo who mastermind the most buzzed-about charitable gala in town. On Derby Eve, the scene at the legendary Galt House is always the same: The limos are lined up three lanes deep and crowds of bystanders await the arrivals of fabulously-clad celebrities and luminaries while camera flashes illuminate the darkness. This electric atmosphere is all generated by one event: the black-tie optional Unbridled Eve. Unbridled is a fundraiser for local charity Blessings in a Backpack that has become the must-attend Derby gala for a who's who list of stars, including Mira Sorvino, Beau Bridges, Louis Gosset Jr., Ray Liotta, Cheech Marin and Luke Bryan. Co-creators Tonya York Dees and Tammy York Day have carefully cultivated a setting that never fails to impress guests who’ve partied on both coasts and all over the globe. They enter on the requisite luxurious red carpet, then mix and mingle during a cocktail reception fueled by fantastic signature cocktails and a killer bar. This year’s spirits will include fine wines, champagnes, vodkas, custom cocktails from Southern Glazer’s Wine & Spirits, and of course, a wide selection of bourbons. There's a gourmet dinner served in the hotel's Grand Ballroom, followed by live music from the incomparable Louisville Crashers and, always, surprise appearances from Grammy level performers who have included Ruben Studdard and Kris Allen. This party goes late. Attendees dance into the night, and with a little perseverance and maybe a quick Bloody Mary, everybody is off to the races at Churchill Downs the next morning. Creating an event like this in the first place, and keeping it fresh year after year, is a herculean task, which is why it’s no surprise that it takes two remarkable women to make it happen. The synergy between Tonya York Dees and Tammy York Day puts a new spin on the sister dynamic. The two often speak for each other. One always seems to know what the other is thinking before she says it. They occasionally finish each other's sentences. And they always, always have each other's backs. Unbridled all comes as a result not only of their shared vision, but of this unparalleled closeness. "I think of the two of us as a unit," says Tammy. "You really can't have one of us without the other. People always mix us up for the other and think we're twins, even though we don't think that we look that much alike." They're tight the way you can only be with someone you grew up in close quarters with. "I always say that I prayed her into existence," Tonya reminisces. "The doctors kept saying that this was most likely to be a boy, but I just knew otherwise. When our parents brought Tammy home, I told them so. I knew all along! We were best friends immediately." Each of their lives followed a similar sort of trajectory. They studied business in communications, economics and finance, then put their education and passion to work in big ways. Tonya served the city for Greater Louisville Inc. before founding York Management, Inc. Tammy was Chief Operating Officer of Delta Dental before taking her current role as the president and CEO of the Louisville Healthcare Council. Remembering an emphasis on doing things for others that had been instilled in their family life from the beginning, the sisters were always intent on giving back and finding ways to actively improve the lives of those in need. Tonya and Tammy volunteered and chaired charity events together for years, amassing a dedicated team and unparalleled acumen in the field. In 2012 they decided to strike out on their own with an entirely original concept, and Unbridled Eve was born. A completely philanthropic endeavor, this non-profit exists solely to raise funds and awareness for imperative charities like Blessings in a Backpack, an organization dedicated to bringing an end to childhood hunger. 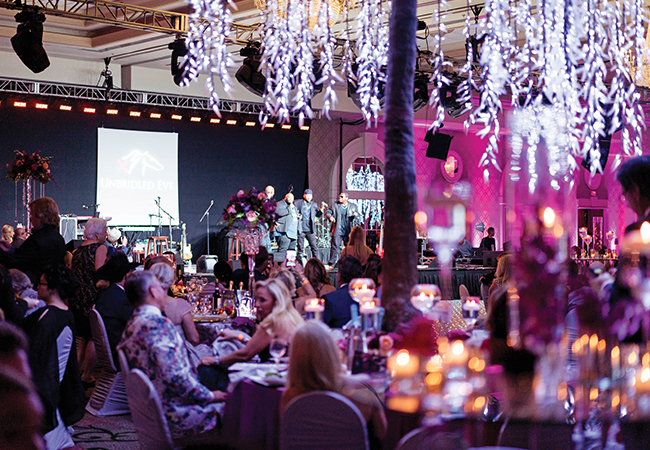 Unbridled Eve has continued to grow every year since and has attracted attention internationally—not only because it’s such a spectacular soiree, but also in part because of the Derby Prelude party. That’s an event that the sisters hold in West Hollywood every other January, once hosted by none other than Louisville perennial favorite, Jennifer Lawrence. It’s a cocktail party designed to cultivate relationships with sponsors, celebrities, and other people of influence, bringing people together towards the common goal of raising awareness for Unbridled and its charity partners. Much more than one singular event, Unbridled Eve is an ongoing, massively complicated logistical project that most would find daunting, but these two do it so well because they do it together—along with a team of dedicated volunteers. "We're very proud of our sponsors, attendees, and everyone who contributes every year to ultimately help make the world a better place," Tonya says. "The long-term plan for this event is to add leverage to a new level of success and to help support economic development for the entire area, and it's amazing to watch that grow." The Unbridled Eve Gala will be held in the Grand Ballroom of the Galt House from 7:00 p.m. until 1:30 a.m. on Friday, May 3. For tickets, tables or to make a donation to the Unbridled Charitable Foundation, email [email protected] or [email protected] or call 502-894-9768.